Earlier this week we experienced a tragedy here in Boston: two firefighters were killed Wednesday fighting a restaurant fire in the neighborhood of West Roxbury. Today the people of Boston and throughout Massachusetts mourn the loss of two brave firefighters who tragically lost their lives last night. Paul J. Cahill and Warren J. Payne selflessly answered the call to service, placing our public safety above their own needs. At this terribly sad moment we pray for Paul and Warren, their families and friends, the more than 100 firefighters who responded at the fire, and all the men and women of the Boston Fire Department. We pray for those injured last night and ask God to bless them with the strength to recover. The words of the Firefighters prayer remind us of the commitment to public service that Paul and Warren witnessed with their lives: “I want to fulfill my calling, To give the best in me, To guard my friend and neighbor….” God bless them and keep them. Also, yesterday evening I made visit to the firehouse where the men served to offer my prayers and condolences. Be assured that we continue to pray for the two fallen firefighters, their loved ones and all those who are touched by this loss. On Sunday we had the blessing of the new altar at Blessed Kateri Tekakwitha Parish in Plymouth, and it was a beautiful celebration. 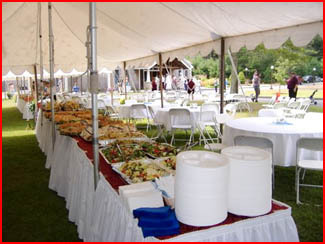 Jim Braley, the pastor, has worked very hard there. 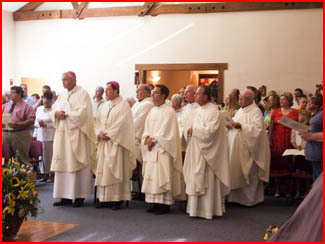 Father Jack Schatzel, the founding pastor, was there, as well as Bishop Robert Hennessey, who had been stationed in Plymouth, and Bishop John Dooher, who is the regional bishop. One of our seminarians, Gerald Souza, is from the parish and was there to help serve. There were Native American women from the Mohawk and Algonquin tribes who came from New York to be part of the celebration. The women represented the two tribes of Blessed Kateri’s heritage. Her Father was a member of the Mohawk tribe and her mother was of the Algonquin tribe. 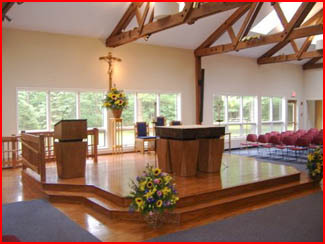 The Plymouth parish is one of the few churches named for Blessed Kateri. 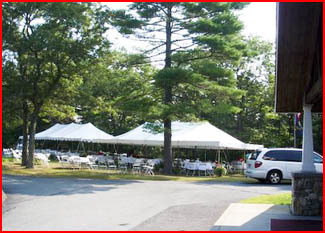 It is a very beautiful rite, and we had a reception afterwards with tents set up outside. It was a beautiful day for it — perfect. 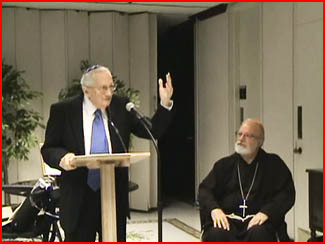 That evening, we had a celebration for Rabbi Leon Klenicki. The Knighthood of St. Gregory, the highest award that can be given to a non-Catholic, was bestowed on him in the context of a prayer service that began with a hymn and then there was a reading from the prophet Micah read by his wife, Myra. 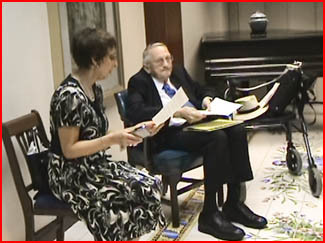 Rabbi Leon was working for the Anti-Defamation League (ADL) and has been very active in Catholic-Jewish relations. He has taught at the American College of the Immaculate Conception in Louven, Belgium — also known as The American College at Louvain — and various other Catholic seminaries. He has done studies on St. John of the Cross and Catholic scriptures. He is a man who for decades has been involved in interreligious dialogue. 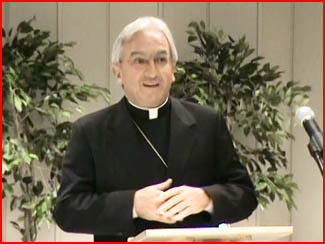 He has worked very closely with the U.S. Conference of Catholic Bishops (USCCB) and many other Catholic organizations over the years to implement Nostra Aetate, Second Vatican Council’s Declaration on the Relationship of the Church to Non-Christian Religions that, among other things, called for an end to anti-Semitism. I had known the rabbi back in the 70s when I was in Washington, D.C. He actually conducted a Seder meal in Spanish for my entire parish, which was a beautiful celebration to help people to understand the Jewish roots of our Eucharist. We wanted to have him attend the Seder meal in Boston last spring, but Rabbi Klenicki has had some health problems, and he is unable to travel. He is retired and now lives in New Jersey. 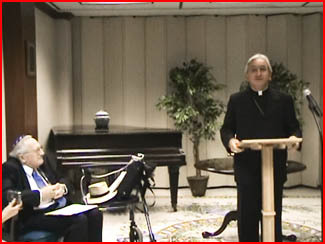 So Archbishop Celestino Migliore, who is the permanent observer of the Holy See to the United Nations in New York, offered very graciously to use the offices that they have near the U.N. When we announced the honor here in Boston last spring at the Catholic-Jewish Seder meal, there was great enthusiasm because so many people know Rabbi Klenicki and are aware of the wonderful interfaith work he has done. So it was gratifying first of all to see how happy people were that he was getting this award, and it was very moving to see how touched he was by being so recognized. At the event, the rabbi spoke very, very beautifully about his relationship with the Church and said that this honor was one of the most significant events in his life. We were all touched to see how much it meant to him. Rabbi Leon worked nationally, so he was well known here in Boston, in Washington, in New York and in Rome. 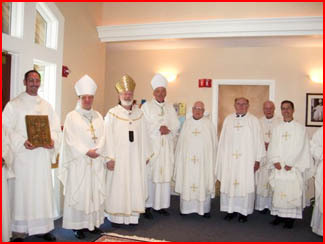 So some of us went down from Boston and other people from the USCCB in Washington came up to be a part of it. 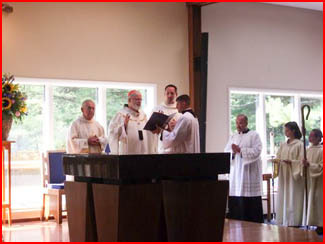 One of the priests who was there was Father Peter Stravinskas. He had been the public relations officer for the Catholic League for Religious and Civil Rights, which worked very closely with the ADL years ago and formed a very deep and lasting friendship with Rabbi Leon and Myra. A number of rabbis and leaders from the Jewish community were present for the event. There were a number of cardinals — Cardinals Walter Casper, Edward Cassidy and Jorge Mejia — who were unable to attend but wanted to be remembered to the rabbi and to congratulate him. 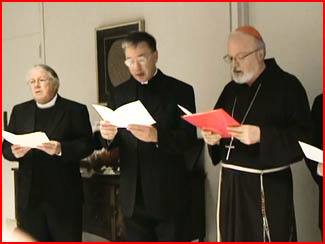 They have all been working in the ecumenical and interreligious dialogue. The rabbi also received messages, greetings and congratulations, in Spanish from the B’nai brith Argentina. 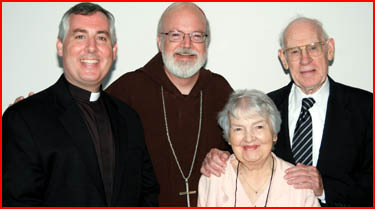 Father Arthur Kennedy, who was acting as master of ceremonies, introduced me to talk about the reasons for the honor. Father Kennedy was the executive director of the bishops’ national Secretariat for Ecumenical and Interreligious Affairs and is the new rector at St. John’s Seminary in Brighton. Shalom aleichem! It is a distinct pleasure to welcome you to this celebration honoring Rabbi Leon Klenicki with those venerable words, words also used by the Rabbi Yeshua to greet His disciples on Easter night. The Hebrew greeting of peace is not a mere social convention; it goes to the very heart of biblical religion, which teaches us that God’s peace is concerned with harmony, wholeness, right relationships. The first set of relationships is that between Almighty God and the believing community and between the Lord God and the individual believer. When those relationships are in place, then peace between human beings naturally follows. Rabbi Klenicki has been a true rabbi, teacher, educator in the ways of peace. The peace he has sought to foster, however, is not the peace of the grave or the mere absence of war. It is a peace rooted in justice and truth. Which is why and how, as a much younger priest, I first contacted the Rabbi (who was likewise a much younger rabbi) over thirty years ago to assist my parishioners at the Capilla Latina in Washington, D.C., in understanding the Jewish roots of their Catholic Faith. Our common hope was that knowing such information would lead to correct attitudes and, yes, right relationships. Our hope was not disappointed. What Rabbi Klenicki did for our Hispanic community was not a unique effort on his part; it was becoming the very life-blood of his life’s work as he committed himself to the arduous but necessary task of inter-faith dialogue, to bring about mutual understanding. A native of Argentina, Rabbi Leon Klenicki you began your schooling in Buenos Aires and studied philosophy and classics at the University of Buenos Aires. In 1959, having received a scholarship to study at the Hebrew Union College-Jewish Institute of Religion in Cincinnati, you completed your rabbinical studies. You received a B.A. in Philosophy at the University of Cincinnati as well as an M.A.H.L. (Masters of Arts in Hebrew Letters) a Rabbinical Semihah, Rabbinical diploma, at HUC-JIR in 1967, and a Ph.D., Honoris Causa, in 1992. From your earliest student days, Rabbi Klenicki, you have been interested in interreligious dialogue. Your thesis for the B.A. in Philosophy, “An Analysis of the Mystical Language of St. John of the Cross,” opened a way that was continued in the thesis for your rabbinical degree, “The Biblia de Alba. The Examination of the Methods and Sources of a Translation of a Fifteenth Century Illuminated Spanish Bible.” Both were investigations into the field of Jewish-Christian relationship that prepared you for a life dedicated to the study and contributions that you have made for over four decades. Your contribution at a meeting of Jews and Catholics in Bogota, Colombia, in 1968 which had been organized by the Anti-Defamation League of B’nai B’rith and CELAM (Latin American Episcopal Conference), was an historical event during the visit of Pope Paul VI to Colombia. It was the first time that Jews and Catholics met in Latin America with representatives from most of countries, and it paved the way for future dialogues and interreligious work. Already the trust in your scholarship and wisdom were recognized when you were asked by CELAM and the Argentine Council of Jews and Christians to undertake a study of catechisms and Catholic religious texts, the first of its kind to be done in South America. Your valuable recommendations were presented to the Bishops Conference in Argentina and called for a revision of the presentation of Jews and Judaism in Catholic texts. You led work on behalf of the Council of Jews and Christians in study sessions of the Catholic Understanding of Jews at the Vatican. When you became the spiritual leader of Congregation Emanu-El in 1969, Buenos Aires, you published a prayer book in Spanish and Hebrew, the first printed Reform Book of Prayers in Latin America adapted to the Argentinean Jewish experience. In October 1973, you were invited by ADL to become head of the Jewish-Catholic Relations Department. 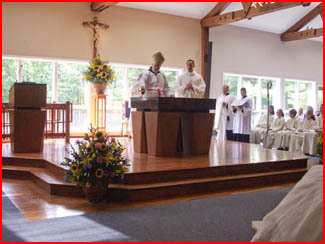 You have lectured and taught at several Catholic universities and seminaries, including Sacred Heart University in Bridgeport, Connecticut, Immaculate Conception Seminary in Huntington, New York and The Catholic University of Louvain in Louvain, Belguim. Your academic contributions include innumerable volumes of books and articles, some on the most important theological, philosophical, historical and spiritual topics, others on the careful mediation of the important kind of teaching that ordinary readers have long loved to study. In 1984, you became the Director of ADL’s Department of Interfaith Affairs and ADL’s Co-Liaison to the Vatican holding these positions until your retirement in January of 2001. 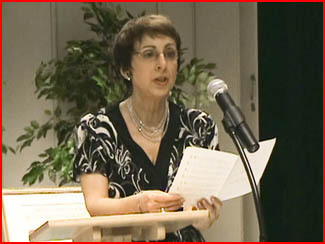 In 2003 you were one of the founding members of the Interfaith Theological Forum which sought to build on the important earlier work that flowed from the Decree of Vatican II, Nostra Aetate #4 in reshaping the educational texts for Catholic catechesis on Jews and Christians, by calling for new possibilities of serious common conversations on theological topics and questions common to both Jews and Christians. 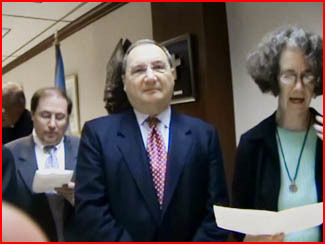 That Forum became the impetus for the important meeting in Washington, D.C. in 2005, celebrating the fortieth anniversary of Nostra Aetate, where there was a common call from both Rabbi Eugene Borowitz and Cardinal Walter Kasper for bringing Jewish-Catholic Dialogue to a new level of maturation. All of your efforts, carried out with so many of the people who have become your friends in both stages of your contributions and commitments to renewed understanding and a deeper sense of full and mutual respect, have been greatly praised and rightly honored. This respect has come from your own religious community, from scholars and theologians, and from bishops, cardinals and Popes, John Paul II and Benedict XVI. Among all those who have been supportive of your work, you have been blessed most especially with your dedicated and loving wife Myra. Because of her care and support of you and your work, we have all been enriched. In your special bond with Pope John Paul II, the spiritual treasures of Jewish Scripture and tradition that you inherited and appropriated in your heart, mind and soul, were both profoundly appreciated and deeply responded to in the spiritual interiority of Pope John Paul. Today I am very pleased to be able to present to you the medallion which the Holy Father Pope Benedict the XVI has asked me to bestow on you, with the title, Papal Knight of the Order of St. Gregory the Great. This is given to honor you for the many years that you have dedicated to both Jewish-Catholic Dialogue and to the full consequences of the promises that they have brought and continue to bring for our future together. Your work has been a service not only to the Jewish community through all the contributions that you have made in so many areas, but this medallion of the Knight of St. Gregory also testifies to the service that you have given to the Catholic Church in its commitment to this mutual dialogue that we know to be God’s will. Some years ago, as a preamble to an essay you wrote, entitled “Toward a Process of Healing: Understanding the Other as a person of God,” you quoted a phrase from Martin Buber that speaks in a sense to all ages. Buber remarks: “We live in an unredeemed world. But out of each human life that is unarbitrary and bound to the world, a seed of redemption falls into the world, and the harvest is God’s.” May that harvest celebrate and bless you for all that you have done and continue to do. Can we not see in those remarks an apt application to what we are about here today – a “consolidation” and validation of a life’s endeavors to “overcome old prejudices” and to promote “fuller recognition of that ‘bond’ and that ‘common patrimony’ that exists between Christians and Jews.” That, I believe, is what Pope Benedict wants us to understand in today’s ceremony and what I am privileged to present on his behalf. I also want to acknowledge the great work of both Abe Foxman, the National Director of the Anti-Defamation League, and Sister Celia Deutsch, a Sister of Sion, who has been very active in ADL as well. 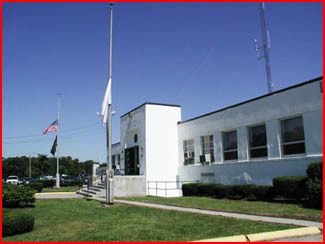 Then on Wednesday, I visited the MCI-Cedar Junction in Walpole. We had Mass in the high-security prison, and it was the feast of the beheading of St. John the Baptist, which is also the 37th anniversary of my ordination. I thought it was a very good way to spend my anniversary ministering to our prison population. 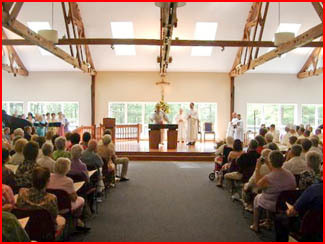 Father Tom Stanton, the chaplain at Walpole, is doing an outstanding job. I went around to visit a lot of the prisoners in the different cell blocks. We brought them Communion and had to pass the Eucharist to them underneath the door. We put a pall on the floor and said the prayers. That was a moving experience to see how grateful the men were to receive the sacrament. Then, I had a meeting with about 40-50 inmates. We had a discussion where we answered questions and prayed with them. 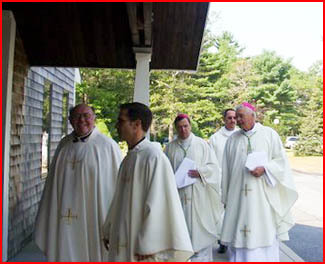 On Thursday evening, we had a Mass in the chapel at St. Theresa of Avila Parish in West Roxbury to install Father Mark O’Connell as the new Judicial Vicar of the Archdiocese (what we used to call the “officialis”). 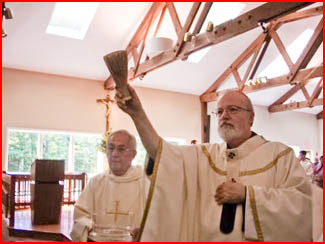 Father Mark previously served as Assistant to the Moderator of the Curia for Canonical Affairs and Adjutant Judicial Vicar and Vice-Chancellor. As Judicial Vicar, he will have the responsibilities of running the day-to-day operations of the Metropolitan Tribunal, the local Church court which deals with canonical issues. 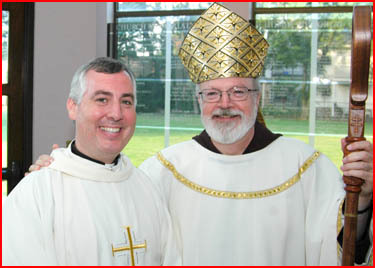 We are very grateful for the outstanding service that Father Mark has given. He is replacing Father Mahoney who did that job so well. 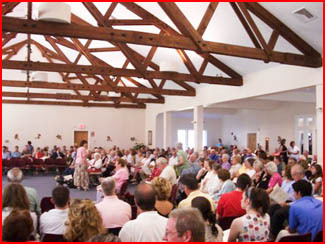 The installation took place at a Mass with the staff, and a reception followed. 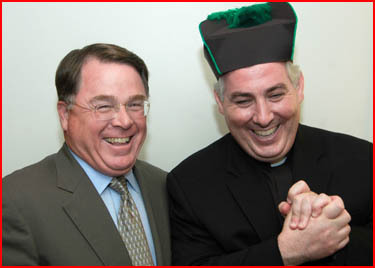 In honor of the occasion our Chancellor, Jim McDonough, presented Father Mark with the gift of biretta with green tuft. 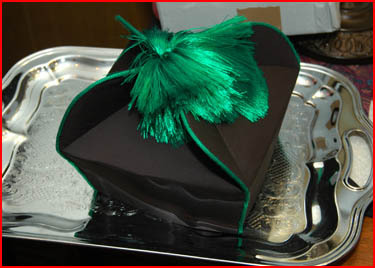 Those with a doctoral degree from a pontifical university are entitled to wear the four-peaked biretta in academic settings. The green tuft indicates a doctorate in canon law. (some other colors include scarlet for theology and dark blue for philosophy). Father Mark seemed a bit surprised, but pleased. 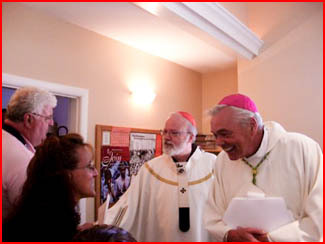 Brother Jim Peterson, who will fill Father O’Connell’s former position, was also there. I am grateful to the New York province of Capuchins for sending us a young brother, who is a both civil and canon lawyer. Finally, for my photo of the week I have chosen this photo of the beautiful tabernacle at St. Theresa’s in West Roxbury. 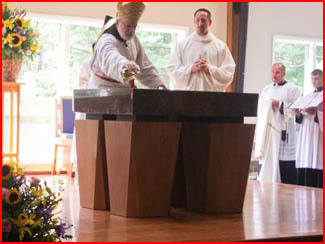 It was created by Father Raymond Helmick, the brother of Msgr. 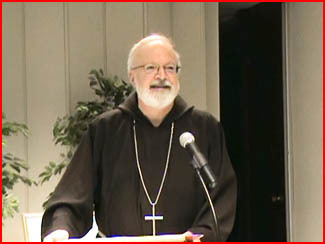 William Helmick, pastor of St. Theresa’s. I hope you find it as impressive as I do.